Artemis & Gracie, originally uploaded by dovesroost. 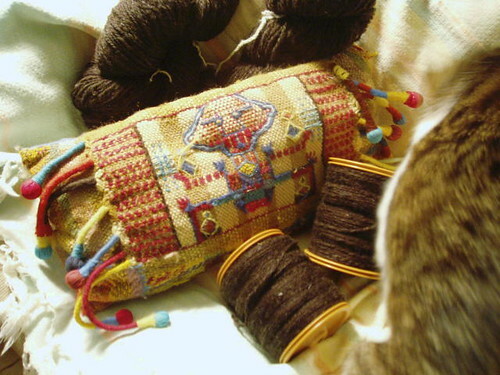 Nine ounces of two ply on bobbins being inspected by Artemis. This was wee hours spinning. 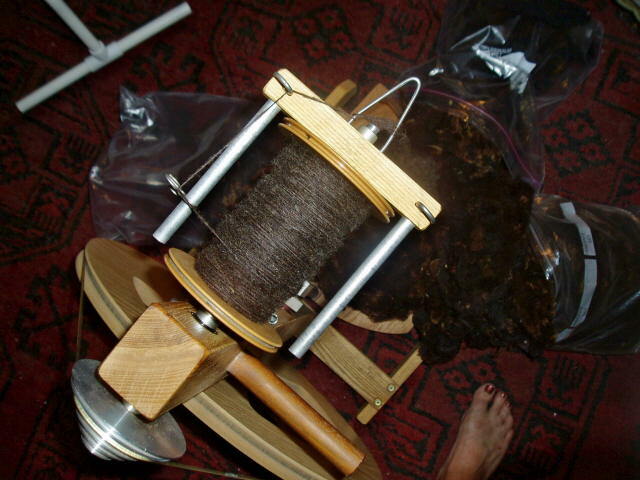 I was up and gone for an installation today…but…in the middle o the night…ah insomnia…I carded a pile of little batts, pulled a bunch of roving, and spun 3/4 of an ounce. I’ve been gone all day, but here I am, back at the ranch, and I have three bags full of Gracie…so I am going after her tonight, in a big way. 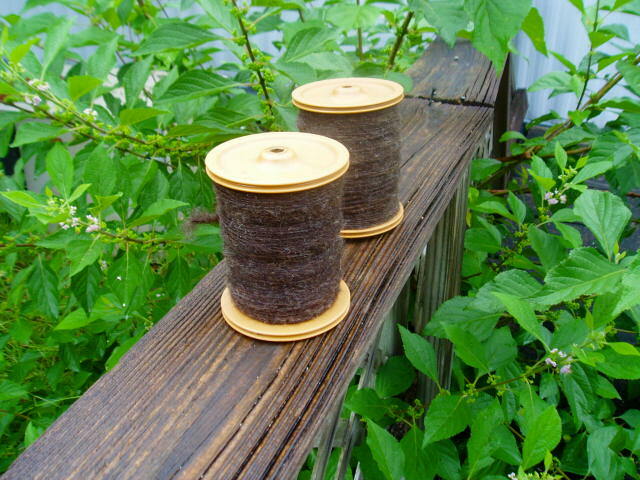 I’d like to get this second 8 or 9 ounces plied…I’ll feel like I’m home free! 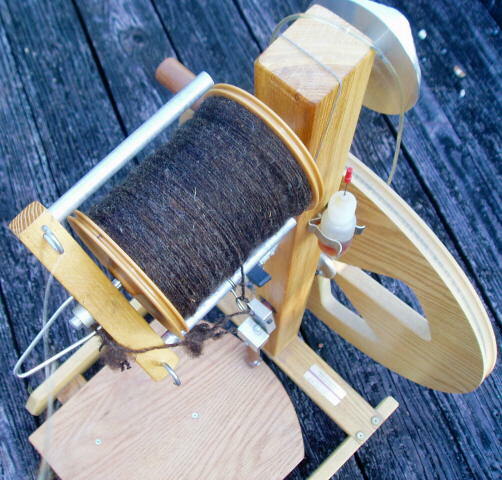 As I post to the Tour board on Ravelry every day, I check out my teammates…Team Hopelessly Overcommitted…you are rockin the wheels (and spindles) Babies! Alrighty…8.5 oz in knittable yarn spun…and here we have another 4 – 4.5 oz singles. More roving pulled…yep…more spinning ahead for the evening…Couple more days and I’ll have plenty many skeins of yarn to complete Tom’s “Gracie” sweater. Woot! Day 4, July 6, spent most of the day spraying lacquer on maple cabinet doors – for a Thursday installation. But, in between coats, I scoured all the rest of Gracie, about a pound. The soft lovely fleece dried on a screen on the back deck before the afternoon rains came. 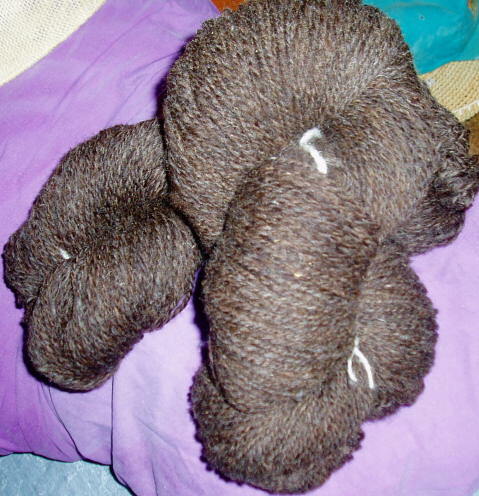 I did pull 2 more balls of roving, and spun those. I’ll be carding and pulling and spinning into the night. Til tomorrow, then! It’s been a day, kids. I did a little bit of carding, did a little bit of spinning, and now I’m ready to do a little bit of reading, and a little bit of sleeping, and start all over again. Most of the day was spent on a cabinet installation. Some of the day on caring for critters. 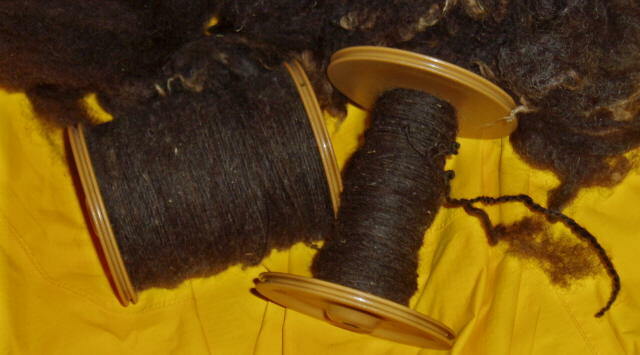 And not enough of the day on fiber, or the Tour de Fleece. Tomorrow is, as they say, another day. Finished bobbin #2 of singles this morning. The resulting 2-ply measures 498 yards. After sanding a kitchen’s worth of Southern maple raised panel doors, I got around to carding, pulling roving, and yes, spinning. 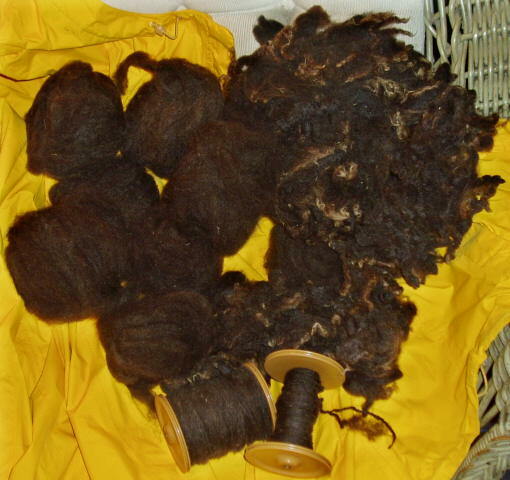 This photo, aside from being lousy with reflected absorbed and otherwise screwball light, shows some of the fleece that I scoured yesterday, shows what’s left of the roving I pulled after carding my head off, and shows the first bobbin and a bit of singles yarn. 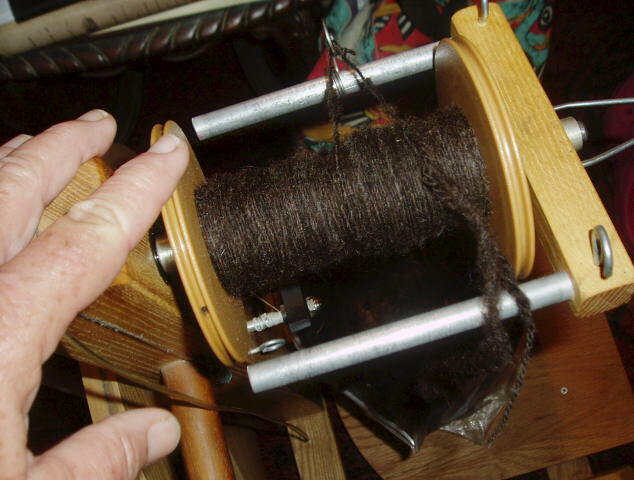 Know that each ball of roving is a quarter of an ounce, and that a full bobbin holds about four and a half ounces, and you can figure out how many balls of roving I pulled today before being able to spin. Yes. I pulled 30 balls of roving. Somewhere over 8 ounces of fleece. Carded with handcards. Mmm. Yes. My shoulders are a little bit sore. There are 9 balls of roving left…and I will get around to them, very soon. 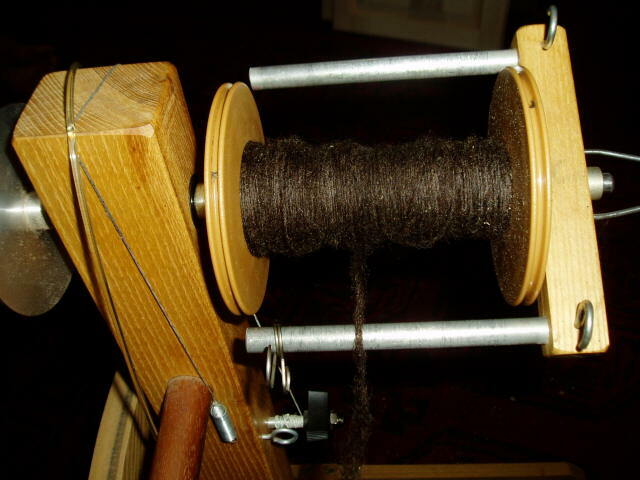 The spinning goes like lightning though, compared to the carding. So, in reality, I have to start carding again. Right now. In order to have a good amount to spin tomorrow. The goal is to have enough 2-ply to finish Tom’s sweater. I’m thinking 22 – 24 ounces. Five four and a half ounce skeins. That oughta do it. Yes. I have a long way to go. Here’s a close up of today’s yarn.